Join us for the premiere of this new show about the breaking points, both literal and figurative, that cause us to change our lives. A multi-character solo work presented through acting, physical theater and magic. Recommended for 16+ due to language and adult content. Creator/performer Christopher Bange is a magician, clown & actor based in Seattle, who has been touring his fringe shows to festivals around the world for over a decade. 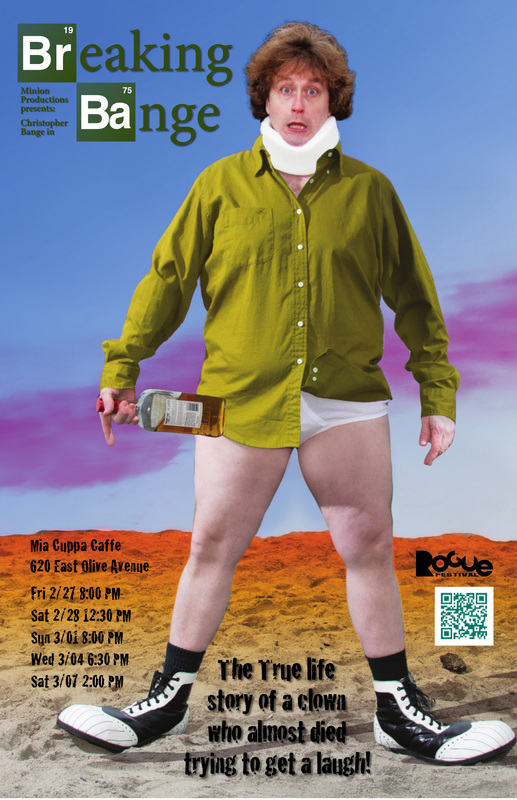 He performed "The Fat Guy Show" at Rogue in 2012 and "More Bange for your Buck!" on the Mia Cuppa stage at the 'Seattle-to-Fresno' event in September. Producer Grant Knutson of Minion Productions has spent the last five years helping independent artists develop their shows and plan tours. This is his fourth year at the Rogue Fest, having previously produced "The Fat Guy Show", "Apocalypse Clown" and "Dolores" for Fresno crowds, and co-producing last Fall's 'Seattle-to-Fresno' event at Mia Cuppa.